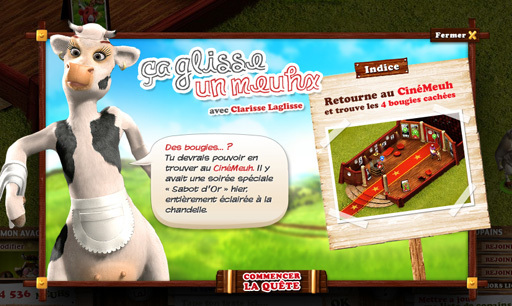 “La Quête des Bougies” is a point and click game. Users have to find lost candles on the map to finalize the LVQR anniversary cake. 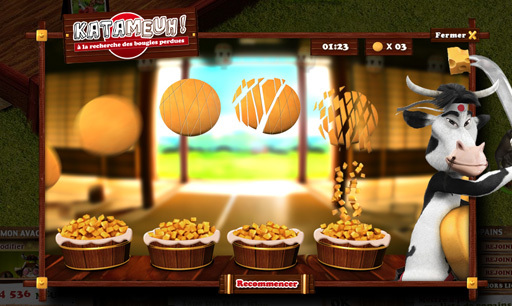 User could search everywhere on the platform : into the game and products pages. 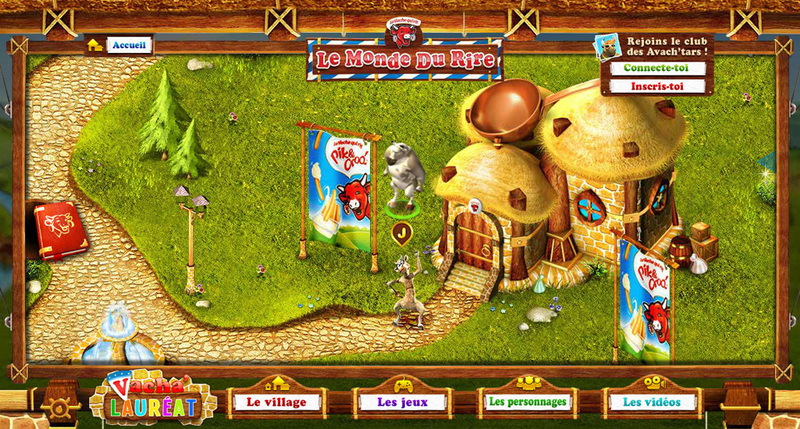 During this quest of candles, many activities are available : an open map (the Vach’ Parc) with several games free-to-play and optional quests. 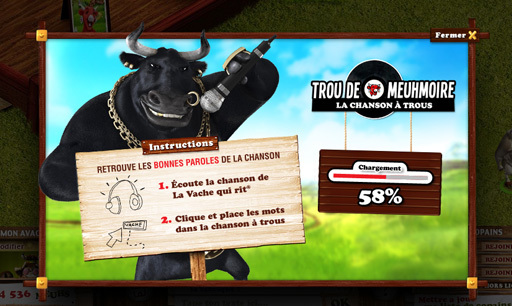 The digital communication of The Laughing Cow ® in France is build around the website “Le Monde du Rire” (“The World of laughter”) created by Mediagong Leo Burnett in 2010. Its a platform fun-oriented, dedicated to children and parents, with contents regularly updated : brand contents, games, news products, discounts, brand events. In 2011, it was the 90th year anniversary of The Laughing Cow ®. The client needed a new game, ease to use but funny to play, inspired by the event. 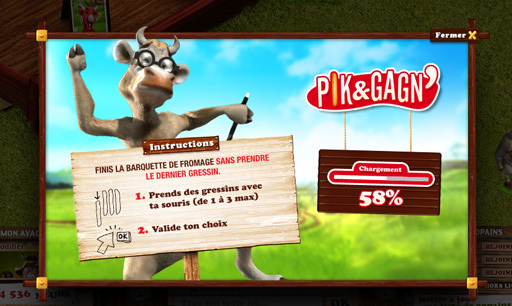 The agency proposal was a Point and Click Game – RPG-like – named “La Quête des Bougies”. In this game, users have to find lost candles on the map to finalize the LVQR anniversary cake. 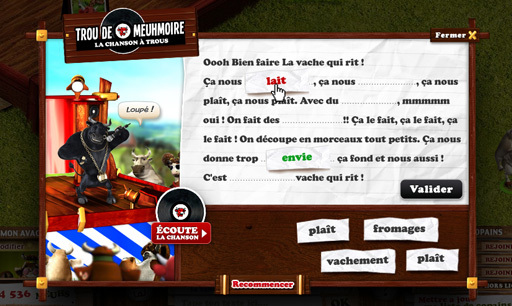 User could search everywhere on the platform : on the game, on the shop and products pages. 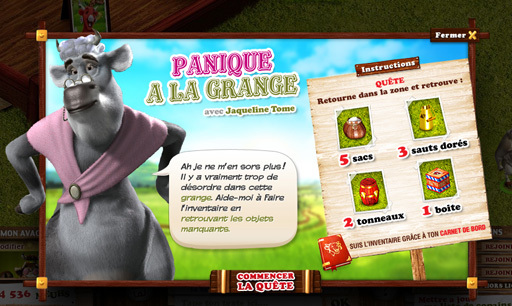 During this quest of candles, many activities are available : an open map (the Vach’ Parc) with several games free-to-play and optional quests. Balance a good level design for a playtime of 3 mn maximum. Make an efficient user interface over the global website. Conception brainstorming with the core team (creative director and producer). This step included rules, challenges, mini-game mechanics, level design, functional guidelines. Sketchs, trends definition, interface designing, declinations and final product quality. 3D characters designing : © Mac Guff Ligne Paris. 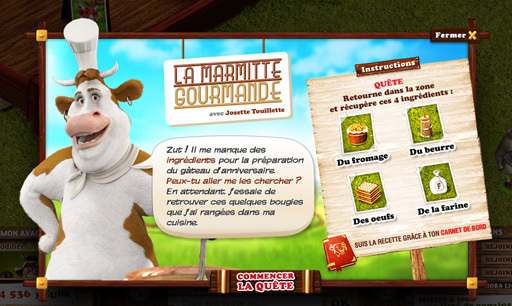 The product is localized by name nearly everywhere it is sold : La vache qui rit in France, Canada, Switzerland, Greece, the Netherlands and Belgium. 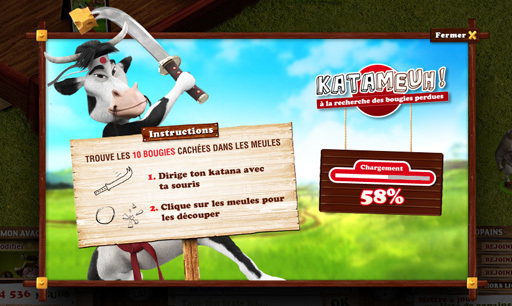 The Laughing Cow in English-speaking countries. Die lachende Kuh in German-speaking countries except Switzerland where it’s known as La vache qui rit. 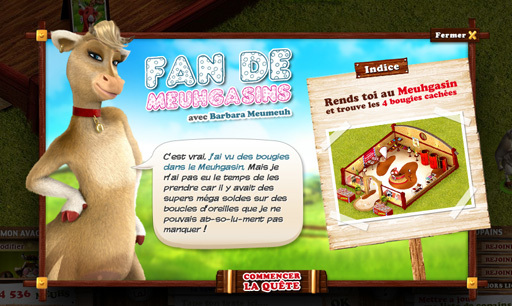 البقرة الضاحكة (Al-Baqara Ad-Dahika) in Arabic-speaking countries (It is also often sold under the French name, La vache qui rit). Veselá kráva in the Czech Republic. Krówka Śmieszka in Poland. La vaca que ríe in Spanish-speaking countries. A vaca que ri in Portuguese-speaking countries. Văcuța veselă in Romania. Весела Корівка in (Vesela Korivka) in Ukraine. Весёлая Бурёнка (Vessiolaia Bourionka) in Russia. Den Skrattande Kon in Sweden. Den leende ko in Denmark. Η Αγελάδα που Γελά (I Agelada pou Gela) in Cyprus. La vache qui rit, Gülen İnek in Turkey. 乐芝牛 in China. 笑牛牌 in Hong Kong. Ilay omby vavy mifaly in Madagascar. ラフィングカウ (Rafingu Kau) in Japan. La Mucca che ride in Italy. Con Bò Cười in Vietnam. Sapi Ceria in Indonesia. 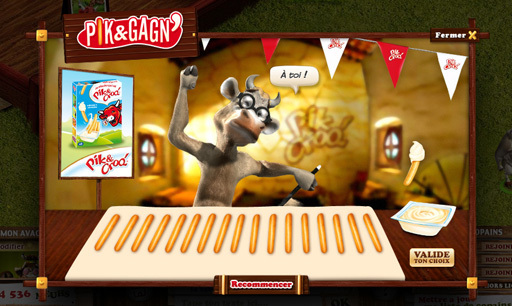 This entry was posted in Digital Art Direction and tagged Bel, Digital, F2P, François Soulignac, Free to play, game, Graphic design, La vache qui rit, Lean management, Lean production, Web Digital Art Direction by François Soulignac. Bookmark the permalink.